Love, love, LOVE the use of Nord lockwashers. I cannot speak highly enough of them. I would encourage every team to section a few sample crimps to see that everything is working as expected. 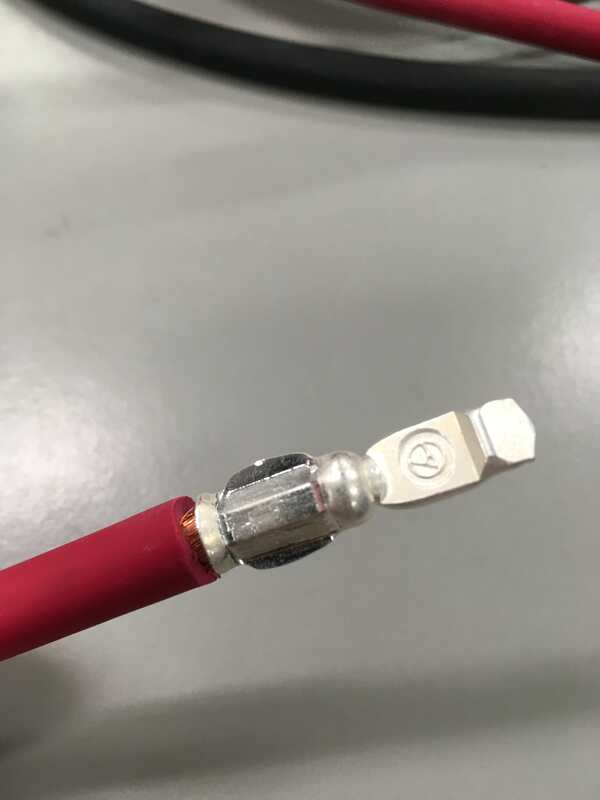 4awg crimps should have 140lbf (UL) to 400lbf (Mil Spec) pullout strength, so a simple hand-tug will only catch the worst of the worst crimp attempts. Great write-up, I am pleased to see more and more teams opening up the biggest electrical bottleneck in FRC! Our crimp tool (very similar to you guys’, one of the hydraulic ones from Amazon) came with metric dies. We put the end of the contact into a vice, tugged on the wire with as much force as we could and it seems to hold fine. Just wondering if this might result in any long term problems…? Flashing from crimping is normal. Higher-end crimping tools have trimmers that cut this flashing off automatically. Just file the flashing down if it doesn’t fit in the SB housing and you’ll be fine. Are SB120s actually legal to use on FRC robots? My impression was that only the SB50 was allowed. Did I miss something in the rules this year? What is the actual observed benefit for using larger gauge wire for FRC battery connections? I get that there’s less resistance, but does this result in longer runtimes or more efficient discharges, or something else? How significant is this benefit, has anyone measured it, or are the results mostly anecdotal? Yes, the rules simply specify an “SB” connector. Larger margin on brown-outs was the single biggest reason we switched to 2AWG main wiring last year, which improved ~0.4-0.7V under peak loading vs 6awg wiring. Operating at higher voltages improves available power, run time, reduces motor heating, and results in generally more consistent performance over a match. Being worth it is up to your team to decide based on your priorities. We’re not going back to 6awg any time soon though. Hey, I was wondering if someone could re-upload the whitepaper, it seems the script hasnt made it here yet. You can use archive.org to pull it from the old Chief until Brandon gets the media stuff sorted out. First, I have to say this is fine White Paper, well done guys. Second, I have to point out that copper clad aluminum wire is illegal for use on FRC robots under R60. Yes SB120 connectors are legal, but as Allan pointed out above and as specified in the Robot Rules, many batteries and in particular those provided in the Spare Parts will be wired with the SB50. As to wire sizing, each 3 steps in AWG wire size is approx. doubling or halving the wire conductive cross section. The step from #6 to #4 is less than twice the conductive copper. At 600 amps (the absolute highest current available from a fully charged new battery) would drop .234 volts per foot for the #6 wire and .144 volts per foot for the #4. A typical FRC robot will have about 2 feet of wire length total from battery to PDP, so 4 feet (total for both red and black) would be 0.936 volt for #6 and .576 volts for #4 about 0.4 volts difference when measured at the input of the PDP at max current. Your mileage will vary. You cannot judge the conductive area by eye. It will vary with strand size. 7 strand wire will have a different diameter than 31 strand wire. Wire purchased on Amazon may not be as advertised as the seller simply measures the cross section and looks up the size on a wire chart. I inspected wire purchased on Amazon as #10 and I measured it at #13. A good hint that the wire is different size is that the wire size is not printed on the wire. The greatest cause of brownout in my opinion, is slipping battery and wire terminals. I have suggested for many years a method for removing this problem with the addition of a simple #10 external tooth lockwasher. If you place the lockwasher between the battery terminal and the wire terminal, the lockwasher will prevent any movement between the two terminals. No movement results in no loosening of the connection. Please use the locking hardware that comes with most batteries. This would be a split washer and flat washer under the nut. I would estimate over 90% of all brownouts are caused by loose battery terminals. A loose battery connection raises the series resistance of the primary wiring and therefore increases the voltage drop of the primary wiring. Nord-lock washers are the absolute bomb to replace split washers on the battery terminals. I highly recommend them. Hi 900, are you running the same upgrade on the robot side as well? Found any particularly good lugs for the PDP connection? I’m hand-modifying the battery lugs with a file to fit right now, not super happy with it and looking for better options. At the very least I’m thinking we’ll draw up and mill the modifications in a systematic way, going forward. So I used to do that and then I realized if I just screwed them in, they fit. We’re using the ones linked in the paper (Thomas Betts 54906BE).